If you wish to conjure up the aura of sophistication and unsurpassed romance at your wedding celebration, there’s only one possible choice of musical entertainment – Swing Jazz. Hollywood – the apogee of romance and elegant lifestyle portrayed on the silver screen and summed up in the literate lyrics and mellifluous melodies of Broadway. 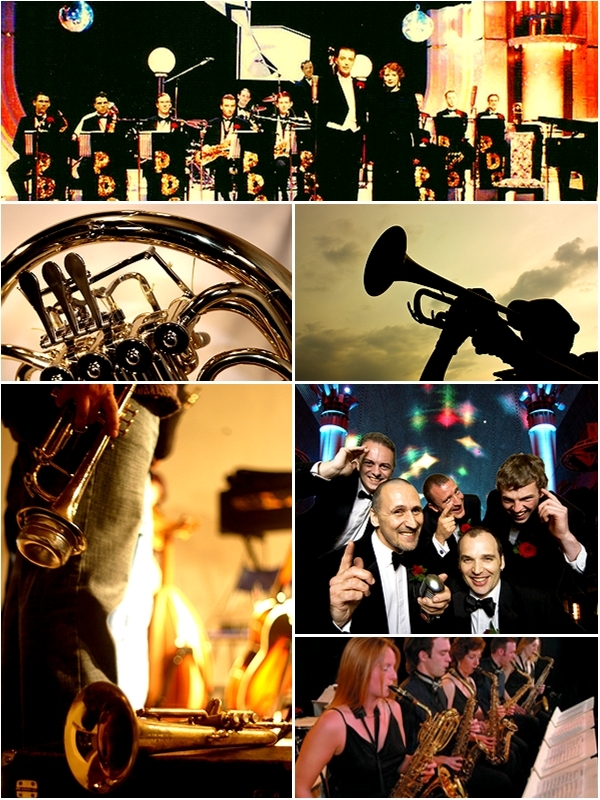 Find out more about booking a Swing Jazz band for your wedding. The unrivalled craftsmanship of the songs and dance-routines specially commissioned for the smash-hit Broadway Musicals of the ‘tweenwar years cries out for the full dance orchestra or ‘Big Band’ treatment, yet these classics of the jazz genre are no less effective when skilfully arranged for smaller forces. Small wonder that they are revived at regular intervals, with Jamie Cullum and Robbie Williams only the most recent offerings in homage to the Sinatra originals. Class is permanent! As with all dance music, rhythm plays a fundamental role, and in swing jazz this is often underpinned by double-bass, together with drums in larger ensembles. Other rhythm and harmony instruments can include piano, guitar or accordion. Some bands are brass-orientated, with trumpet and trombone sharing the lead with saxophone or clarinet, whereas other ensembles favour strings, with solo guitar and violin fronting the melody. This flexibility of instrumentation makes for exciting and original arrangements of what have become iconic jazz standards. A piano/saxophone or violin/guitar duo creates a warm, intimate atmosphere as background to a champagne reception, whereas a six-piece or more, fronted by a crooning vocalist, can present an eminently danceable swing spectacular for entertainment later in the evening. From ‘Hot Club’ café music to Big Band dancehall extravaganza, swing jazz can be modified and tailored to appeal to a wide variety of audiences. As with nearly all substyles of jazz, swing relies heavily on improvisation over a given melody or chord-sequence, thus producing each time a unique arrangement of that tune. The extemporising musicians set up a melodic and harmonic dialogue between them, usually generating a high level of energy and intensity which readily communicates with the audience, which is why swing jazz can be such engaging, exciting music. Peeling back the years to a more genteel, elegant and sophisticated era when glitz and glamour, chic and romance were watchwords, a Swing Jazz Band can effortlessly evoke the spirit of the age. From intimate, slow, smoochy ballads to frisky, irresistible up-tempo invitations to ‘Let’s face the music, and dance!’ this broad range of superlative musical entertainment will appeal to all ages, and is an ideal choice for a wedding reception party.